Discover the proven process for maximizing the potential value of any project. 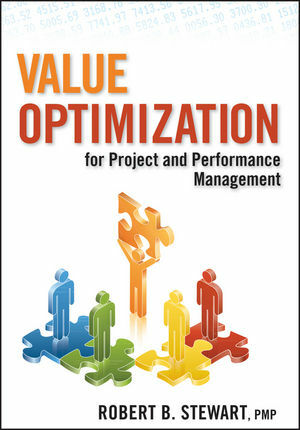 Showing readers how to apply value optimization techniques to project and performance management, dramatically increasing results and efficiency, Value Optimization for Project and Performance Management is written to compliment the Project Management Body of Knowledge, the guidance published by the Project Management Institute (PMI®), making it readily applicable for any project manager. Brimming with examples, Value Optimization for Project and Performance Management provides a link to a free software demo for you to get started in applying value optimization in your own organization. ROBERT B. STEWART,CVS, FSAVE, PMP, is President of Value Management Strategies, Inc., a consulting firm specializing in the application of value methodology to projects and business processes. He has led over 300 value studies for clients in private and public sectors and trained thousands of individuals worldwide in value optimization techniques. He is a Fellow of SAVE International and serves as a Director on the Lawrence Delos Miles Value Foundation, a nonprofit organization established to promote and fund the development of educational programs, new applications, and a research library for the study of Value Methodology (VM).